2012 heralds the newest additions to the MiniFlex series of benchtop X-ray diffraction (XRD) analyzers. The new 5th generation MiniFlex is a general purpose X-ray diffractometer that can perform qualitative and quantitative analysis of polycrystalline materials. MiniFlex is now available in two variations. Operating at 600 watts (X-ray tube), the MiniFlex 600 is twice as powerful as other benchtop models, enabling faster analysis and improved overall throughput. 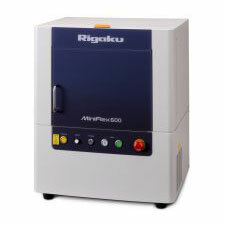 Running at 300 watts (X-ray tube), the new MiniFlex 300 does not require an external heat exchanger. Each model is engineered to maximize flexibility in a benchtop package. system with an available sample changer. Whether teaching X-ray diffraction at the college and university level, or routine industrial quality assurance, the MiniFlex delivers both performance and value. Each MiniFlex comes standard with the latest version of PDXL, Rigaku’s full-function powder diffraction analysis package. The latest version of PDXL offers important new functionality; including a fundamental parameter method (FP) for more accurate peak calculation, phase identification using the Crystallography Open Database (COD), and a wizard for ab inito crystal structure analysis. The original MiniFlex, introduced in 1973, was designed to empower a novice user to produce results, with a compact XRD instrument, comparable to those obtainable by a trained diffractionist. The new MiniFlex builds upon the characteristics which have made it popular for many years – including compact size and robust design – enabling installation in a small space with easy-to-use operation and very low cost-of-ownership.